In the early morning of April 7, 1945, the battleship Yamato, the light cruiser Yahagi, and eight destroyers went past the small island of Kuroshima on their way to Okinawa to carry out a special (suicide) attack. American aircraft sank Yamato, Yahagi, and four destroyers long before they got close to Okinawa. Takehiko Ena made a sortie from Kushira Naval Air Base on May 11, 1945, in a three-man Type 97 Carrier Attack Bomber (Allied code name of Kate) as part of the Kamikaze Special Attack Corps 3rd Seiki Squadron. When the plane had engine problems, Ena and the other two crewman made a forced landing in the sea about one kilometer from Kuroshima and swam to shore. They stayed on the small island for about two and half months until picked up by a small Army transport submarine at the end of July. This is the island where early at daybreak on April 7, 1945, there was a send-off for the Yamato Special Attack Fleet sortie. The 4,044 spirits of the dead became the cornerstone of peace. We dedicate this monument here as we pray that they may rest in peace as they return riding upon the south wind. The map to the left of the Battleship Yamato Monument shows the course of the Yamato Special Attack Fleet along with the times that the ships passed various locations. The map also indicates where the battleship Yamato, light cruiser Yahagi, and destroyers Isokaze, Hamakaze, Asashimo, and Kasumi sank on April 7, 1945. The cleared area called Kuroshima Peace Park in the mountains near Ohsato Village where the Battleship Yamato Monument stands also has a Special Attack Peace Kannon erected in 2004, Peace Bell put up in 2006, Dōki no Sakura (Cherry Blossoms of Same Class) monument, and torii gate. These were made possible through contributions by Takehiko Ena, who after the war's end continued for many years to provide support the island where he and his other two crew members had been treated kindly when stranded there for two and half months near the end of the war. 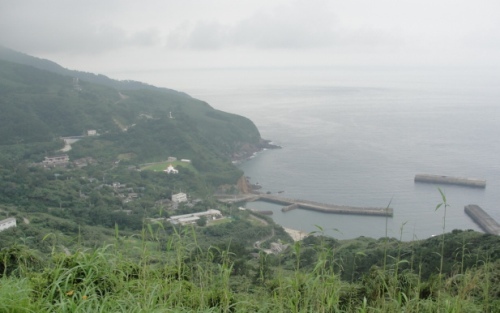 Lifelong Kuroshima resident Yasuo Hidaka was 11 years old when he saw the battleship Yamato and the other ships of the Special Attack Fleet pass nearby to the north of the small island as they were heading west. 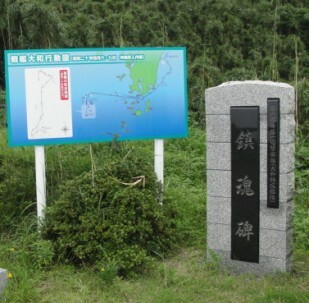 The plaque also lists information about the eight persons living in Mishima who died from American air attacks during 1945.